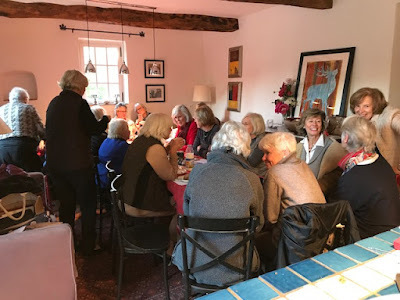 Our December meeting is always a bit special. 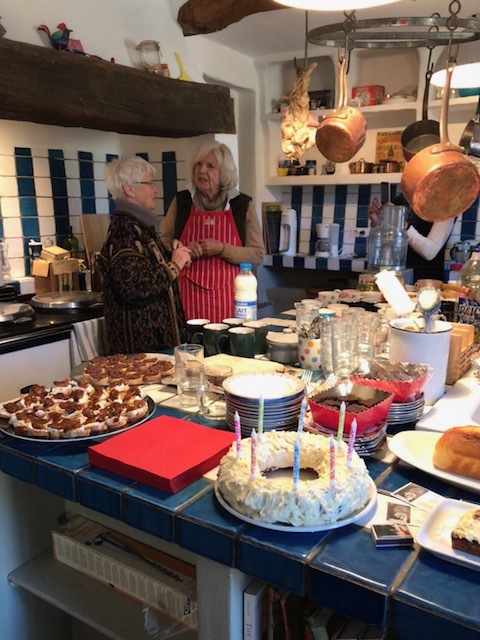 This time we celebrated the occassion in Francoise's daughter's kitchen. Our member, Gillian Duffy made tapenade, showed us how to brine olives and how to make a quick pickle recipe, all seasonal products. 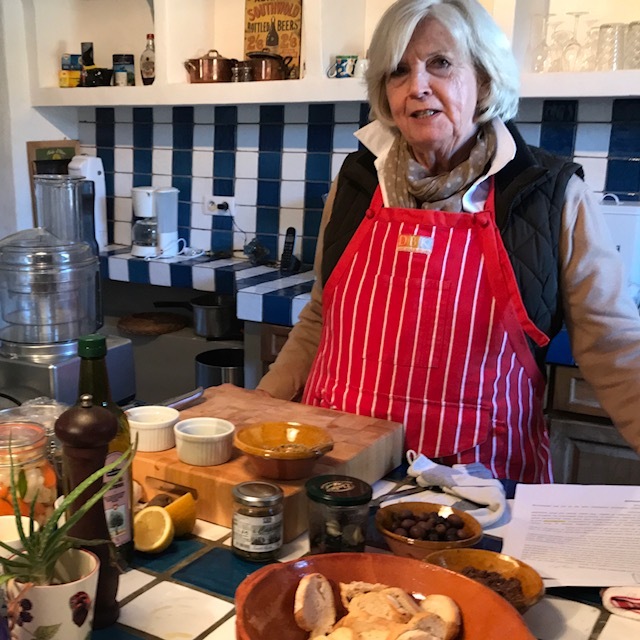 Gillian told us that in 1956 after a very warm January when the sap in the olive trees has been rising, February turned out to be very cold causing the trunks of the olive trees to burst open. Luckily the roots where not affected, the olive trees regrew with multiple trunks, a reminder of the big freeze of 1956. Another bit of info dating back to February 1956, Lorgues was cut off for 3 weeks because of the amount of snow that had fallen. The village was 2 days away from running out of food when the road to Draguignan was opened. Apart from toasts with Tapanade and other nibbles, Francoise made a 'Christmas cake', Sue a 'Christmas Carrot Cake' and Mavis 'Mulled Wine'. Preheat oven to 350 deg. F (175 deg.C). Grease and flour a 9 x 13 ins. baking tin. In a large bowl, beat together eggs, oil, castor sugar and 2 tsp. vanilla essence. Mix in flour, salt and cinnamon. Stir in carrots then fold in walnuts and pour into prepared baking tins. Bake in the preheated oven for 40 to 50 minutes or until a toothpick inserted into the centre of the cake comes out clean. Leave in pan for 10 minutes then turn out onto a wire rack and cool completely. In a medium bowl, combine softened butter and cream cheese with sugar and 1 tsp. vanilla essence. Beat until the mixture is smooth and creamy. Making sure the cake is complete cooled, smooth the frosting to the top of the cake only (not sides) and sprinkle with chopped walnuts. If the mix is too soft, place in the fridge to firm up. Some recipes include chopped walnuts in the topping but this makes it difficult to spread evenly. If the baking tin is too small and too deep the cake will take longer to cook or be soggy in the middle. Use two smaller round or square baking tins and use frosting between the layers like a Victoria sponge cake and on top. To prevent the cake rising too much, make a dip in the middle with the back of a large spoon just before putting it in the oven. Half fill a rectangular bread tin; with the back of a spoon, make a dip down the middle of the mixture to prevent the cake rising too much. Bake, and add icing on top to a single layer (easier to cut into slices). Cupcake or muffin mould (for portion control !) – fill to two/thirds, do not fill to the rim. If you want a flatter shape for icing, make a rounded dent in the top with the back of a spoon. Reduce cooking time. Pour the wine into a large saucepan. Add the other ingredients. Heat until nearly boiling then simmer gently for half an hour. Strain into a warmed jug or bowl and serve. Remove the stones from the olives with a pitter, sharp knife or just by pressing down on the olive. Put the garlic, juice, capers, anchovies, and thyme in a food processor and pulse until well blended. Add the olives and pulse to a coarse paste. Slowly pour the oil through the feed tube, pulsing as you go, until it's the texture you like – you may not need all the oil. Taste and add black pepper if necessary. 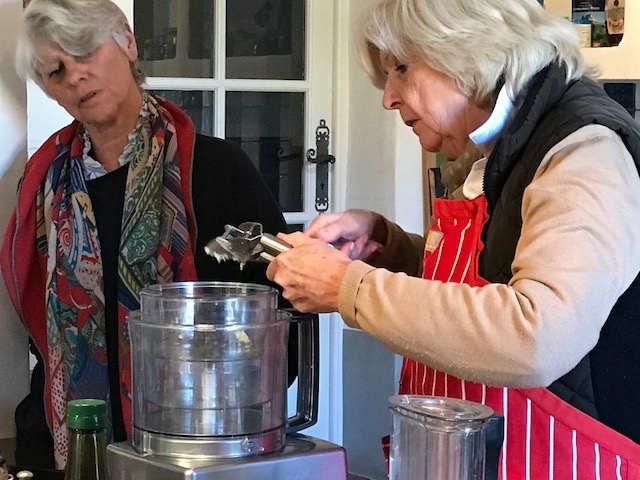 Alternatively, pound the garlic, anchovies, capers and thyme together in a pestle and mortar until smooth, followed by the olives, leaving these slightly more chunky, then gradually add the oil and lemon juice, pounding between pours. Taste, and add pepper and more lemon juice if necessary. You can afford to be generous with the oil: the soft, fruity flavour rounds out all those savoury notes beautifully, as well as loosening the consistency. Serve with toasted rounds of stale, breadsticks or crudités pour les minceurs, and, most importantly, a large, cold drink. Wash the olives under cold water, and check them to make sure they do not have any bruises or fruit fly damage. Put them in a large container and cover with water. Change the water for the olives every day. It could be 10 days, 2 weeks or longer. Feel the olives they should be quite oily, but not soft to the touch. If you bite into them they shouldn't be too hard or bitter! The main thing is to change the water daily. I think this year I left them for 2 1/2 weeks. 100g rock salt per 1 litre of water. Add a few bay leaves, wild fennel seeds and stalks, and thyme. Add salt, water and herbs to a saucepan and bring to a good boil, then set aside and allow to cool. Fill the jars with olives and a couple of fresh bay leaves to each jar, some thyme and wild fennel seeds and stalks. Then leave them in a dark place until Easter. Wash the olives and place in a large glass container, add water to cover them and close with a lid. (You can split the olives by beating them lightly without crushing them, to speed up the process.) Change the water every day to extract the bitterness for about 2 weeks. Mix the above ingredients together until salt has dissolved. 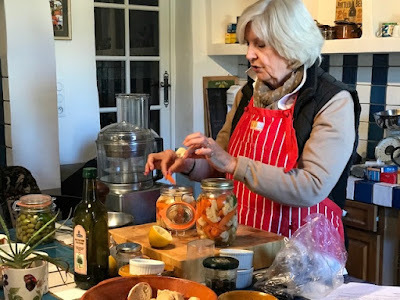 Add a selection of the following to the jars: garlic, chili peppers, lemon slices, coriander seeds, wild fennel stalks and seeds and bay leaves, add the olives and pour in the salt solution until it covers the olives. Close the containers and store in a cool dark place for 2 months. After two months taste an olive to see if the degree of harshness is right for you. If not, change the brine and store the olives for one or two more months. In a word they should be drinkable, and tasting the mixture should be enjoyable. This pickling mix can be used for whatever vegetables you like. 1 cup white vinegar – any basic vinegar is game – apple cider, white wine and rice vinegar all work well, do not use balsamic. 4 cups vegetables (root and cruciferous vegetables will need to be blanched before pickling. Blanch in boiling water for about 2-3 minutes and then shock in iced water to preserve their colour and keep them crisp). Combine all of the ingredients except for the vegetables in a saucepan over high heat and bring to a boil. Reduce the heat and simmer until the sugar and salt have dissolved. Taste for seasoning and adjust as needed. Divide the vegetables between two 2 quart containers and pour the liquid mixture evenly over until the vegetables are completely submerged. Close the containers and refrigerate at least overnight before eating. The pickles will last in the refrigerator for up to a month. 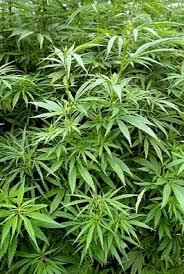 Apart from wool and animal hides, the first plant fibres used by men were Linen and Nettle. Cotton was introduced into Europe by Arab merchants round about 800 AD. 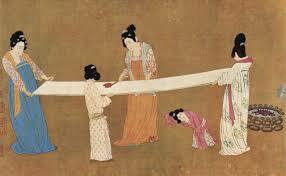 Silk did not arrive in Europe till the 13th Century. 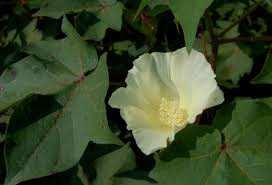 90% of the production of cotton comes from Gossypium hirsutum. Cotton is the most worn natural fibre. It grows in tropical and subtropical areas in arid or semi-arid condtions. 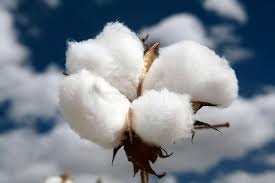 The leading cotton producing countries in the world in descending order are China, India, United States and Pakistan. Cotton is not an environmental friendly crop as it uses lots of pesticides to grow the crop. 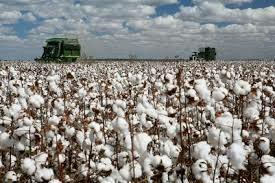 Cotton is an oil seed crop and a protein source for animal feed. The seeds are contained in a capsule. Each seed is surrounded two types of fibres, long and short ones. These are separated from the seeds by a process called ginning. At the first ginning the longer fibres are formed into yarn for high quality textiles. At the second ginning the shorter fibres are formed into yarn for lower quality textiles. This totally untreated, straight off the loom, well suited to a host of household and culinary uses; net curtains, cheese making. 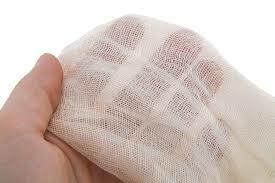 It is a heavy, plain woven fabric. Cotton duck is used in a wide range of applications, from trainers to painting canvases. Calico is a plain-woven fabric made from unbleached and often not fully processed cotton. It may contain un-separated husk parts, for example. 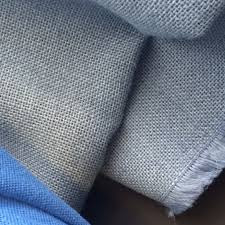 The fabric has an unfinished and undyed appearance. Twill is a weaving pattern with a surface of diagonal, parallel ribs. It gets its name from the city of Mosul in Iraq where it may have been first manufactured. 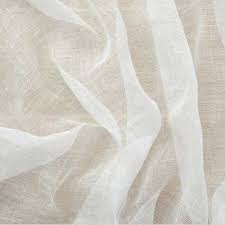 Early muslin was handwoven of very delicate handspun yarn. In the late 19th century scientists were experimenting to produce an artificial silk. It took to the beginning of the 20th before they were successfull. They called the material 'Rayon'. 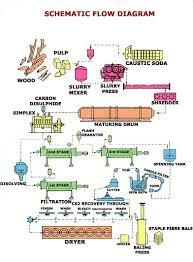 To produce Rayon, wood pulp is chemically converted into a soluble compound. Several chemicals are used in the process. One of them is carbon di-sulphide, a very poisonous chemical for the environment. The carbon di-sulphide is carefully recovered in the manufacturing process, however historically several incidents have resulted in poisoning of the workers. 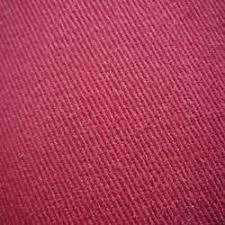 Rayon fabric is soft, falls well, can be easily dyed into brilliant colours. It is lightweight, when wet it looses stability, it can shrink and distort. It needed to be dry-cleaned. It is now superseded by the fabrics mentioned below. Acetate is the 2nd oldest man made material. It uses wood pulp as a base and has to undergo an extensive chemical process to create the filaments for acetate fabrics. It is often mixed with silk, wool or cotton to make the material stronger. An improved Rayon no longer manufactured in Europe because of our environmental restrictions. It is however produced in China and India and sold extensively in Europe. Another type of man-material made from wood pulp. It has to go through a similar process as Viscose Rayon to manufacture the yarn. 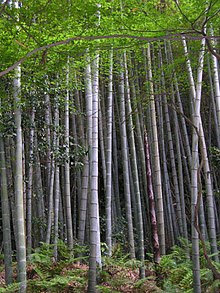 Bamboo is a fast growing crop. In China, Moso Bamboo covers 3 million acres. It is a renewable crop. After harvesting it takes between 3-5 years before the canes reach maturity. Most bamboo clothing has gone through a similar process as Rayon as shown in the schematic above. It is first chopped into bits, soaked into caustic soda (NaOH, Sodium Hydroxide) and eventually treated with Carbon di-sulphide. The emissions of Carbon disulphide CS2 have caused psychosis, heart attacks, liver damage and blindness. In China 75% of the polluting emissions in making Bamboo rayon come from CS2. 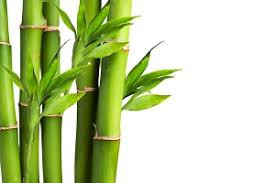 Some advantages of Bamboo over other plant fibres, it produces about 60 tonnes of wood chips per hectare compared to other hard wood trees (20 tonnes per hectare) and Cotton (2 tonnes per hectare). It requires no fertizer or pesticides. It can be harvested every 3-5 years. There are 700 different species of Eucalyptus mostly found in Australia and South East Asia. Several species have been planted in Europe, United States and Africa. Unlike other hard wood trees, Eucalyptus can be harvested by cutting rather than uprooting the trees. It grows backin 7 years making it a renewable material. Lyocell was first made in United States in 1992 by Courtaulds. 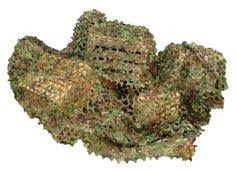 It is an ecologically produced material that goes through a similar process as the other man-made manufactured fibres like rayon or viscose without the toxic by-products. The wood of the Eucalytus tree is broken down by dissolving the wood chips in an non-toxic amino solvent which is later washed from the regenerated fibres and recovered for use. 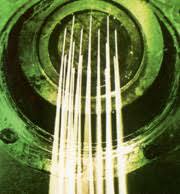 The resulting cellulose viscose solution is then forced through spinnerets to produce stringy fibres coming out of the nozzles. These fibres are spun into Lyocell material. 99% of the chemicals and solvents used in the process to break down the wood pulp are recovered and recycled. The downside is that huge expenses of native forests have been cleared to make way for Eucalyptus plantations. The Iberian peninsula is specially affected with 300.000 ha in Portugal alone. Native fauna and flora has been affected in the process. If Eucalyptus could be grown without having to clear forests it could be a serious competitor to cotton. For the moment only 243,000 tons of Lyocell are produced each year compared to 28.6 million tons for cotton. Lyocell is cool to wear, softer against the skin compared to cotton. It absorbs more water than cotton, useful in hot climates. Pure Lyocell exists but is hard to find, it has a silky feel, falls well, is hardwearing and washes well. 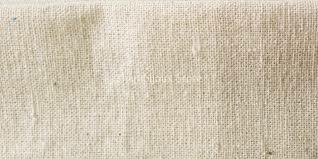 Linen as a material has been known for centuries. The flax plant is an environmentally friendly plant, no chemicals are used. Flax flourishes in cool, damp environments and cannot stand heat. 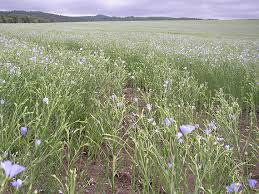 Flax is sown at the end of March, it flowers at the end of May and is harvested just before the seedheads are ripe. In warmer regions like in the Nile River Delta, flax is sown in the winter and harvested in spring. 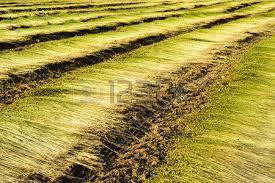 The Flax is pulled out the soil and tied into bundles and then dried on the land. After drying, a bundle of flax is pull through a metal comb to separate the stalks from the seedheads. The leftover stems are soaked into water to loosen the outer woody layer, this process is called 'retting'. Once the woody layer is loose (can be checked by bending the stalks into two) it is passed bit by bit through a machine that bruises the flax. Following this, the bark is removed by beating the flax. What is left are long strings of fine fibre. 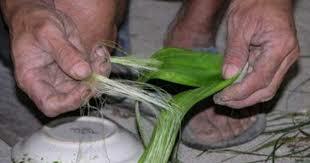 It is once more pulled through a fine metal comb to get long threads that can be spun. Over the last few hundred years machines have been developed that complete the tasks mentioned above but the finest linen is still produced by the old method. The production of Jute is 2nd to cotton. It is an annual crop and takes 120 days to mature. The crop is environmental friendly. 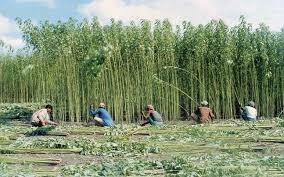 Most of the Jute is grown in India and Bangladesh. The climate has to be warm and wet between 20 and 40 C with a humidity of 70-80%. Jute needs a weekly rainfall of 5-8 cm. There are 2 types of Jute. 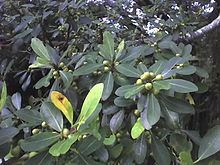 Corchorus olitorious grown on higher altitudes, takes 4-5 months to mature and grows to a height of 6m, but does not like to be water-logged. 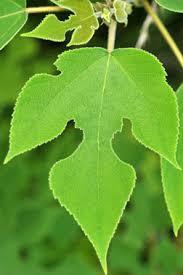 Corchorus capsulatris takes 3-5 months to mature and grows to a height of 2-4 m and does not mind to get its roots wet. 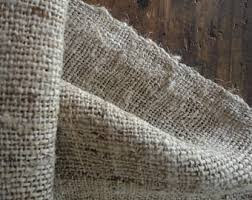 Jute is the same as Hessian, Burlap, Scrim and Gunny cloth. ‘Hessian’ got its name from the former state of Hessen in Germany where the uniform of the soldiers was made of Jute. 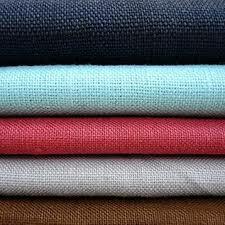 Jute fibres are used for sacking, carpet backing cloth, textile blends and is woven into curtains and chair coverings. 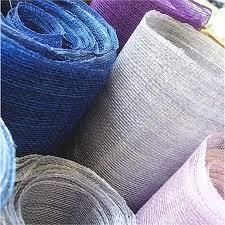 Jute scrim, basic woven jute, is used in construction for reinforcing plaster. Sari’s are made from Jute Silk, using the finest Jute fibres and Silk. 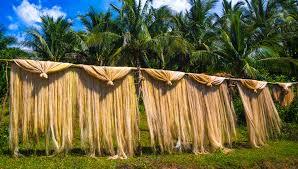 To make the Jute silk the fibres have to be treated with chemicals to make them soft and smooth. 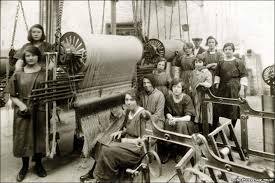 In Dundee by the end of the 19th century the majority of working population were employed in the Jute and related industries and in the extraction of whale oil. They made a discovery in Dundee that to treat Jute with whale oil, the spinning of Jute was possible. The way of extracting the fibres is much the same for all the bast fibres. The Jute is harvested and bundled, then immerged in slow running water called ‘retting’. After the retting the stalks are split and the non-fibrous matter is scraped off, leaving the fibres to be pulled out from within the stem. The fibres are off-white to brown between 1-4 m long. A plant of the northern hemispheres. In 600 BC Hemp was already grown as a crop in China, it came to Europe in the Middle Ages. 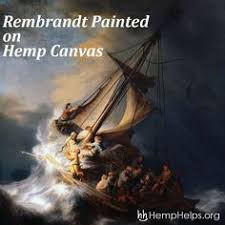 Canvas made from Hemp was used to make the sails for the ships. In fact the word ‘canvas’ comes from Cannabis. Until World War II, it was an important fibre for making clothing next to Cotton and Linen. It lost its popularity with the entrance of synthetic fibres but has now made a come-back with the increased demand for natural fibres. It is an annual and very fast growing, It takes about 90 days to be ready for harvesting. The plant does not need to be treated with pesticides, plus it aerates the soil. The inner bast fibres are very strong and long. They are easily removed as long as the plant has not dried up. 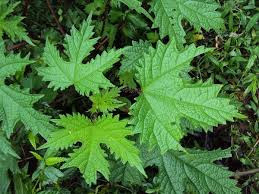 Nettle fabric goes back 2000 years. Not much used in northern Euope since the arrival of cotton in the 9th Century except for Poland were nettle thread was used till 17th century and in Scotland were it was used till the 19th century referred to as ‘Scottish cloth’. During WWI there was a shortage of cotton in Germany as the United Kingdom, who were controlling 90% of the cotton trade, stopped their trade with Germany. Germany temporarily reverted back to using nettle fibre. 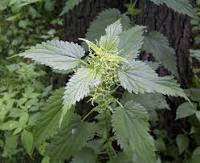 In World War Two, in the countryside of Great Britain hundred of tons of nettles were gathered annually for the extraction of chlorophyll, dyes for camouflage nets. Nettles do very well in northern Europe in areas with a lot of rainfall. The fibres of the nettle are hollow, they can trap air and in doing so are insulating the fabric especially interesting in the winter. By twisting the twine, the hollow core can be closed making it suitable for summer wear. 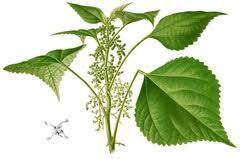 Nettle fibre is 30-50% stronger than cotton and is finer than hemp. 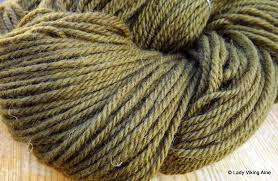 The process of producing nettle yarn is similar to that of linen. Nepal is manufacturing vests and shawls for export. The stalks are collected and sundried for 2-3 days, they are then boiled with wood ash for 3 hours. 7 kg wood ash to 9 kg of dry fibre. After the boiling it has to rest for 20-24 hours. It is then washed in running stream water. After the washing, the nettle fibre is beaten with a wooden stick. This whole process of washing and beating is repeated 3-4 times. It is then dried in the sun for 9-10 hours. Thereafter the fibre is mixed with rice husks and again sundried for 8 hours. It is then washed again and once more beaten 2-3 times. The result is a soft, white, shiny fibre ready to be spun into yarn. Ramie has been grown in China for many centuries and farmers in ancient China are known to have used the fibre to weave clothing. It is a bast fibre crop with a lifespan of 6-20 years. It is harvested two to three times a year, but under good growing conditions can be harvested up to six times per year. 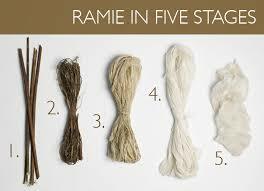 Unlike other bast crops, Ramie requires chemical processing to de-gum the fibre. Degumming is the removal of heavily coated gummy material from the cellulose part of the plant fibre. 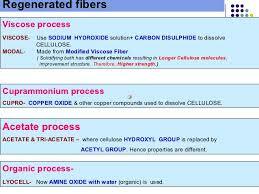 Cellulose is the main component of Ramie fibre. The stems are harvested just before or soon after the beginning of flowering when maximum fibre content is achieved by either cutting just above the lateral roots or else bending the stem. After harvesting, the outer bark and some of the gums and pectins are scraped away so that just the inner bark remains. 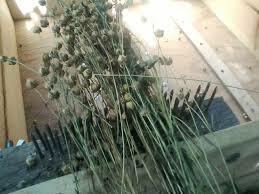 This is done just after harvesting, if not done straight away the stems become too woody. Ramie fibres have 19-30% gums and pectins in the stems. These have to be removed by a chemical or microbial process. Chemical degumming is preferred because it is quicker. After removing the outer, gums and pectins, the leftover material is washed, dried, to extract the spinnable fibre. Ramie is a very strongest fibre, though not very popular in the textile industry because of the difficulty in extraction. China produces 90% of total yield in the world. 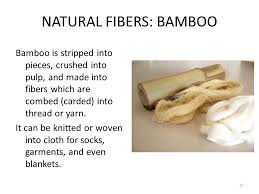 A more natural way of extracting Bamboo to create a material very much like linen is by crushing the woody parts of the bamboo. Steeping it in water is not possible with Bamboo, it does not soften the outer bast, it just developes mildew. After the crushing of the Bamboo canes the Bamboo mass is then subjected to a cocktail of natural enzymes. These enzymes break the walls into a mushy mass. The natural fibres are then mechanically combed out and spun into a yarn. 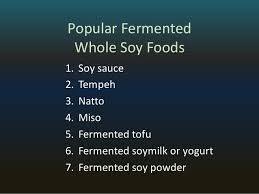 Soybean originated in northern China, from there it travelled to southern China, Korea and Japan. Soybeans have been cultivated for 3000 years. Initially just the pods were eaten. It took another 2000 years before they started the process of fermenting the bean. One of the reasons that soybeans were not very popular was that they were not very palatable. Even after lengthly boiling they remain quite tough and beany and taste a little bitter. Although packed with protein (37% of each bean is protein) they contain an enzyme called ‘trysin’ that interferes with the digestibility of the bean and if eaten whole they pass through our system as roughage with no nutritional value. Fermentation improves the digestibility of soy protein. 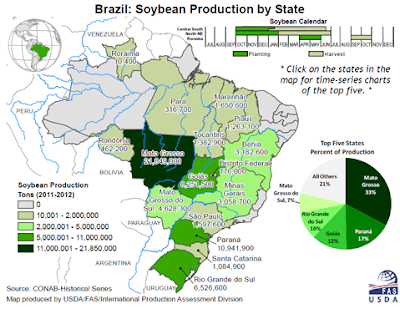 There is a lot of controversy around the soybean, especially in Brazil where huge areas of Amazon rainforest have been cleared for the production of the soybean. In the U.S. there are 83 million acres of soya monoculture changing the environmental landscape of the land. 70% of the world's soybean crop is produced in China from GM (Genetically modified) soybeans. They need lots of water and pesticides to flourish. 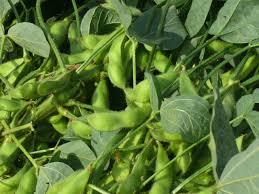 On the positive side it is relatively cheap to produce, no waste, every part of the soybean is used. To process the soybean it has to be cleaned, dried and de-hulled before the oil extraction can begin. The extraction is done with a low boiler solvent at 67C (hexane) as opposed to extracting the oils by pressing, the bean is too hard to be extracted by steam. 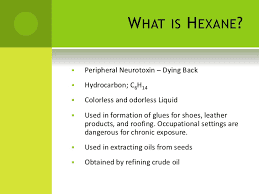 The hexane is recuperated after the extraction and used again. 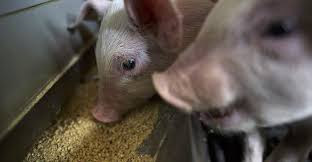 The material left over after the extraction is soymeal and is used mainly for livestock. 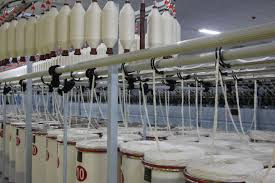 To make yarn, the soymeal is washed and redissolved in an alkaline solution (caustic soda, NaOH), treated with sulphur di-oxide gas and other chemicals and precipitated (a leftover insoluble solid). After this treatment the solid is free of oil. By passing them through a spinnaret the fibres are separated into long strands. Once spun they can be woven into fabric. Soybean silk is used a lot in India to produce sari’s. Native to the Phllipines. A commercial crop in the Phillipines, Equador and Costa Rica. It looks very much like a Banana plant and it belongs to the same family but unlike Banana the fruit is not edible. 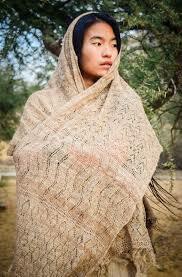 Before synthetic textiles came on the market Abaca was a major source of high quality fibre. 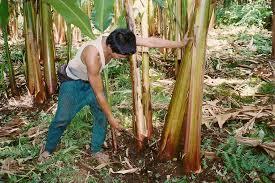 Abaca is very strong, durable, resistant to salt water damage and has a fibre length up to 3m. in the 19th century it was used for ships’ rigging. Today it is principally used in the paper industry, for making ropes, twine and sacking and as a side line clothing, curtains, screens and furnishings. 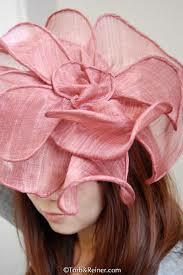 Sinamay, woven from Abaca fibres is a foundation material in the hat making industry. It holds a firm shape. The leaf stalks are cut off from the base of the plant, mature plants have about 12-30 leaves, each leaf stalk is 3.5-6 m tall and can be harvested every 3-4 months. It is labour intensive as each stalk has to be cut into strips, each strip has to be scraped to remove the pulp, then washed and dried. The best quality Abaca is shiny, fine and light beige in colour. Pina is a by product of the Pineapple harvest. 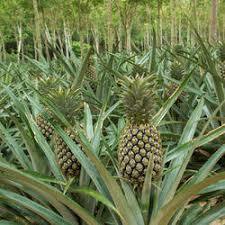 No extra land, water, fertilizer or pesticide is required to produce Pineapple fibre. The leaves are cut off the Pineapple, the outer layer of the leaf is scraped away revealing silky fibres within. It is often mixed with silk or polyester. A tree that grows in north-eastern South Africa, Uganda and Kenya. 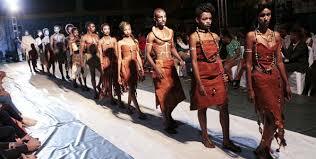 The cloth made from the bark of the tree was used for ceremonial purposes by the Baganda people of Uganda. On a small scale it is still produced today. Some couturiers have used it for dresses and coats. A vertical slit is made into the bark of the tree and the bark is eased away from the trunk. After having removed the bark the tree is covered in banana leaves to stimulate recovery and new bark growth. A Natal Fig tree can be harvested annually for a period of 40 years. After the bark removal, the bark is then folded and submerged in hot water to soften the material. 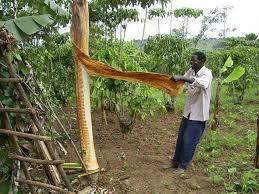 It is then intensively beaten with a mallet to remove excess material and to stretch the bark. 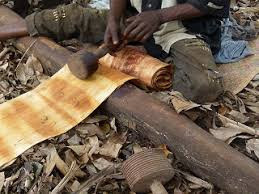 A 50 cm piece of bark after beating can become as large as 2.5 m.
After the beating process the cloth is left to dry in the sun and turns into a deep red, brown colour. It is then moistened again and kneaded until soft and pliable. 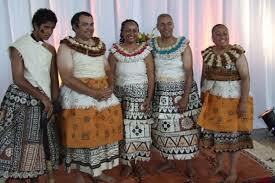 Tapa cloth is a barkcloth made on the Pacific Ocean islands. The inner bark is used for the cloth. It is not woven but softened through a process of soaking, beating and stretching. It is then painted with designs. 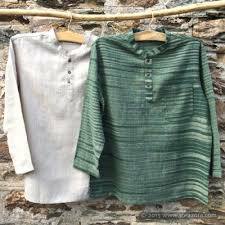 In former times before cotton and other materials reached the island it was used as clothing, now it is only used for special occasions such as weddings.